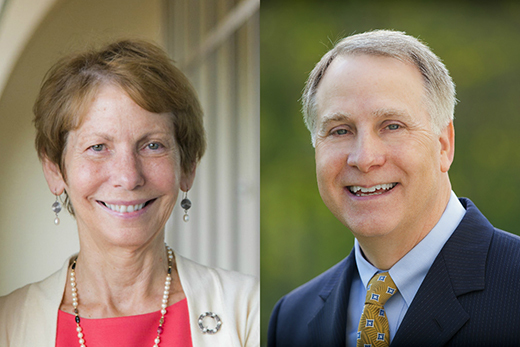 A Creativity Conversation with Emory President James W. Wagner, led by Rosemary Magee, director of the Stuart A. Rose Manuscript, Archives, and Rare Book Library, will take place at 4 p.m. Wednesday, Feb. 24, in the Teaching and Learning Studio of the Rose Library. The event is free and open to the public. Emory's Creativity Conversations series features a one-on-one discussion between an Emory scholar and a distinguished thinker and creator, giving the University community unique access to leaders in a wide range of fields. Wagner, who has served as president of Emory since 2003, holds a PhD in materials science and engineering. He is a charter fellow of the National Academy of Inventors and a fellow in the American Academy of Arts and Sciences. "I'm looking forward to discussing with President Wagner the inspiration for his own creativity," Magee says. "He has long been involved in a number of creative endeavors, including his work as an engineer and a scientist. In addition, he has been personally engaged in creative projects — he built a clock for his daughter, he's a photographer, and he has restored antique cars as well." Wagner says his daughter and her husband still display the clock in their home. "The clock is about five feet tall, entirely wooden — gears and all — with an open design so that the works can be seen in action," he says. One of his favorite photos is of the Dalai Lama, whose hobby is fixing watches, examining the workings of the clock during a visit to campus. The Dalai Lama is Presidential Distinguished Professor at Emory. Magee says she also will ask Wagner about how his work in organizational leadership has tapped into these creative energies, as well as his association with a wide range of scholars, artists and thinkers. His sense of wonder informs his life and work, she notes, such as his delight in discovering a collection of "Philosophical Transactions," a science journal that began publishing papers in 1665, recently given to the Rose Library by its namesake, Emory alumnus Stuart Rose. Magee and Wagner will discuss the conditions that are most conducive to creativity and how the University can foster those. Magee worked closely with Wagner in her previous role as vice president and secretary of Emory. "We had many thoughtful and thought-provoking discussions," she says, which inspired her to invite him to participate in a Creativity Conversation. The conversation is in partnership with the Rose Library and Emory's Center for Creativity and the Arts. The Rose Library is located on Level 10 of Emory's Woodruff Library.